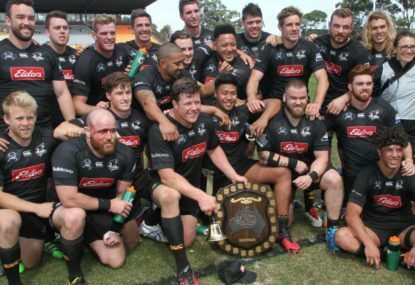 Some outstanding club rugby finals series are now complete, and the Wallabies restored plenty of Australian pride last weekend, meaning it’s a great time to get into the 11-week showcase of up-and-coming talent that is the National Rugby Championship. The addition of the Fijian Drua is the highlight this season, and even just the Fijian feel to proceedings at Tuesday’s launch shows how wonderful an addition they’ll be. The Drua will play in black and sea-blue, and their alternate strip is an outstanding navy and sea-blue hooped number. It’s a great initiative from the ARU and particularly World Rugby to use the NRC as a platform from which Fijian rugby could then build up into a Super Rugby berth. I genuinely can’t wait to see them play, their natural flair is made for this fast-paced competition – they’ll feature heavily in the highlights packages by season’s end. This comp has been the canvas for all kinds of law variations and experiments in past seasons. Many of those first introduced via the NRC – uncontested lineouts, playing penalties out after the sirens, time limits on kicks at goal, bonus points for scoring three more tries than the opposition – have now found their way into Super Rugby and other competitions. This year, the major tweak is a proactive implementation of the six new World Rugby law amendments, which came into effect in the northern hemisphere from August 1 (the Wallabies will encounter them on the Spring Tour), and which will commence in the southern hemisphere from January 1 next year. Of these changes, the biggest is the way the ruck will be officiated. They now become formed when at least one player is on their feet and over the ball on the ground. Players on their feet will now be able to pick up the ball on the floor so long as no opposition player has joined the ruck. The tackler must also now get to his feet before he can play the ball, and must do so through the ‘gate’ from his side of the contest, not from the side as they could previously. This change is designed to make the ruck simpler for both players and referees. If all goes to plan, it should also have the added effect of opening the game up more than it currently is. There will also be slight changes around the way referees signal to the attacking scrumhalf when he can feed the scrum, and new allowances around where he can be positioned, as World Rugby outlined back in July. The other major change is that after three seasons of encouraging attacking play via the points values on offer, the NRC will revert to the more traditional points values of five-point tries, two-point conversions, and three-points penalty and drop goals. I’ve spoken to players and coaches this week, and competition administrators too, and the common belief is that teams will still look to play with the same attacking mindsets they always have. I’ll be interested to see how it plays out. In 2016, we saw 301 tries scored across the 31 games, at an average just under ten tries per game. I’m not sure we’ll see the average quite as high this year, though the new ruck interpretations could certainly allow the game to open up more. If the attacking mindset does remain, then happy days; no-one loses in seeing teams throw the ball around and score tries. On the team front, teams appear to have realised that to be successful, you’ve got to have the right mix of quality and development players. It’s certainly true of the three NSW teams, where we’ve seen plenty of movement of players between the Rays, Eagles, and Rams. The Rams are now under full control of the Eastwood club. For three seasons, the Woodies weren’t prepared to accept any possible financial risk that taking up the offer of a one-dollar, five per cent share in the private entity would incur, but now they’re happy enough to assume full control. The club’s ‘Greater Sydney’ name is back, and the Rams will play all four home games at Eastwood’s TG Millner Oval. We’ll see some nice integration between the NRC and the new University women’s sevens competition, too, with the Rays’ Round 2 match, Brisbane City’s Round 5 home game, and Queensland Country’s Round 6 match fitting in with the Uni sevens schedules at Macquarie University, University of Queensland, and Bond University, respectively. Sadly, there’s an unavoidable clash on the first day of the competition, with the Canberra Vikings’ first home game having to be bumped back to fit in a full day of ACT Junior Rugby finals, causing a clash with the Brisbane City-Fiji broadcast game at Ballymore in the process. A later kick-off wasn’t possible in Canberra, so the clash was very reluctantly agreed to. All other games will have clear air, though, which is important. Importantly, 12 players from the Wallabies squad were this week released to head back to their sides for game time, which was one of the very reasons for creating the competition in the first place. Samu Kerevi, Adam Korczyk, and Kane Douglas (Brisbane City); Joe Powell (Canberra); Izack Rodda and Izaia Perese (Queensland Country); Tetera Faulkner, Curtis Rona, and Billy Meakes (Perth); and Marika Koroibete, Jordan Uelese, and Lopeti Timani (Melbourne) will all feature this weekend. Plenty of teams are offering free entry this year, too (though I’d strongly suggest you check club websites and social media to confirm all details), which should help lift crowds from the improved levels last season. You certainly won’t be disappointed in checking a game or two out this season. Sydney Rays have the bye. There’s a fair bit of guesswork here, based only on squads, but I’m thinking this way for the opening weekend: Canberra and Brisbane City on Saturday, NSW Country and Perth on Sunday.